Is a strangers life worth a million dollars? This is the movies ultimate question. Taking place in the 70's the movie begins by introducing us to the main characters, Norma (Cameron Diaz) and Arthur Lewis (James Marsden), a suburban couple with a young child. In the early hours of the morning the family receives a simple wooden box as a gift, which bears fatal consequences. 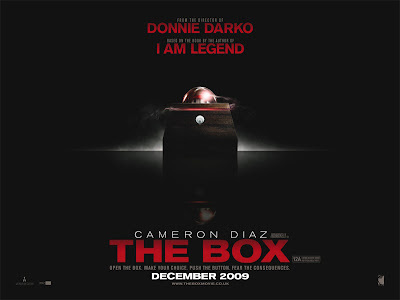 A mysterious stranger (Frank Langella), delivers the message that the box promises to bestow upon its owner $1 million with the simple press of a button. Easy enough... or is it? Because by doing so someone, somewhere in the world, who they do not know, will simultaneously die. Norma and Arthur find themselves in the cross-hairs of a moral dilemma. The couple soon find out the true and ugly nature of their humanity. A million dollars would be nice indeed, but can they live with themselves knowing that it cost them another human beings life? Of course the story is intriguing and has its eerie moments, but Donnie Darko (excellent movie btw) director Richard Kelly's sci-fi thriller proves to be nothing out of the box. I felt the story lacked in a lot of ways. The script (written by Richard Kelly from the short s tory called Button, Button) becomes sillier the longer the story draged on. Obvious questions aren't asked, and there's lots of window dressing about the NASA space program that doesn't pay off dramatically in the end and there's also a weird water scene that confirms the silliness of the story. The moral questions raised and answered by the film are straight-forward enough but they needed elements in Kelly's film to make the experience worth recommending. I found myself confused and wanting throughout the film. It was an interesting premise, however the story didn't grab me like I had hoped it would. I didn't hate the film, nor did I love it and I think it's safe to say I will forget about this film in a couple weeks. So my question to you is: If given the same opportunity here, would you press the button? Service : Client service turned out to be fabulous. Person on the telephone possessed a delightful approach and also My family and i was given funds quickly. Value :My family and i have been given a terrific value the fact that loan rates are actually particularly reasonable.